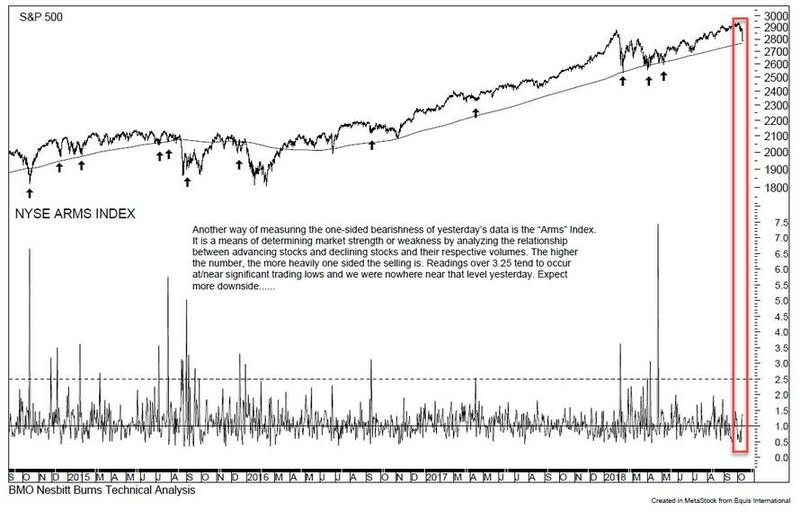 Earlier today, when looking at yesterday's dramatic market plunge, we highlighted a note from BMO technical analyst Russ Visch who showed that, according go the NYSE "ARMS" Index which is a means of determining market strength or weakness by analyzing the relationship between advancing stocks and declining stocks and their respective volumes, Wednesday's selling pressure was actually not that high despite the seemingly relentless push lower in stocks in the afternoon. In other words, there was no "selling panic", and no legitimate liquidation as the selloff was largely a function of coordinated deleveraging by both hedge funds and systematic traders. Which is why as of Thursday morning, Visch had a simple, and correct, conclusion based on yesterday's market action: "Expect more downside." 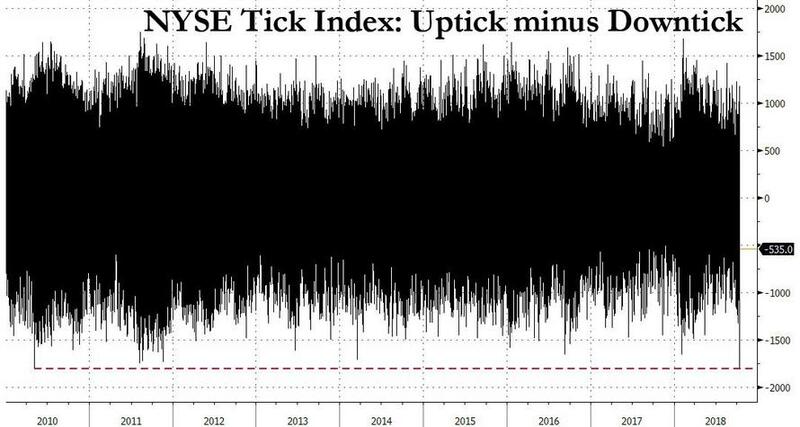 According to the NYSE TICK, or uptick minus downtick, index, at precisely 2:43pm, the selling order flood was so big it not only surpassed the acute liquidation that was observed around 3PM on Wednesday, but the -1,793 print was one that had not been seen for 8 years: as Bay Crest Partners technical analyst Jonathan Krinsky wrote, the sudden and violent surge in selling as measured by the TICK index, when downtick volume overpowered upticks, was the lowest reading since the May 6, 2010 "flash crash" when liquidity dried up in markets, sending the market plummeting for a few minutes, as HFT briefly went haywire (or when a spoofer outsmarted the algos, depending on what version of events one believes). In any case, "someone" was in a massive hurry to get out of the market and was willing to hit literally any and every bid in doing so. So who was it that got the margin call "tap on the shoulder" into the last hour of trading? Picking up where Visch left off, Krinsky said that while "we never know if that was "the" low, but certainly with that type of TICK into support, it can signal "a" low." Incidentally, the "low" he was referring was the S&P e-mini futures falling to 2,730, a price just below the 200DMA and one which saw the highest amount of trading volume over the last 200 days according to Bloomberg. Did the near record burst of selling at 2:43pm mark the bottom? We look forward to Visch's take tomorrow, although absent any major changes in market dynamics, we may know for a fact as soon as tomorrow if the selling pressure persists.